DeNeef, Inc. is not affiliated with any other companies and all registered trademarks are property of the respective companies. 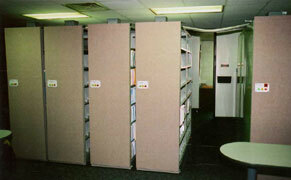 Spacemaster products provide you with the ability to increase your storage and archival facility space by 60%, without adding 1 square foot to your physical plant. It takes advantage of a mobile carriage system that permits you to elimate all but one aisle in a row of shelving units. After you experience the Spacemaster advantage, you will begin looking for other storage locations in your facilities that could free up wasted aisle space and turn hundreds of square feet into productive space.